Nearly two years after he last fought in the UFC and after a mega-payday in his boxing debut against Floyd Mayweather, Conor McGregor will finally return to the Octagon in a lightweight title fight against current champion Khabib Nurmagomedov. 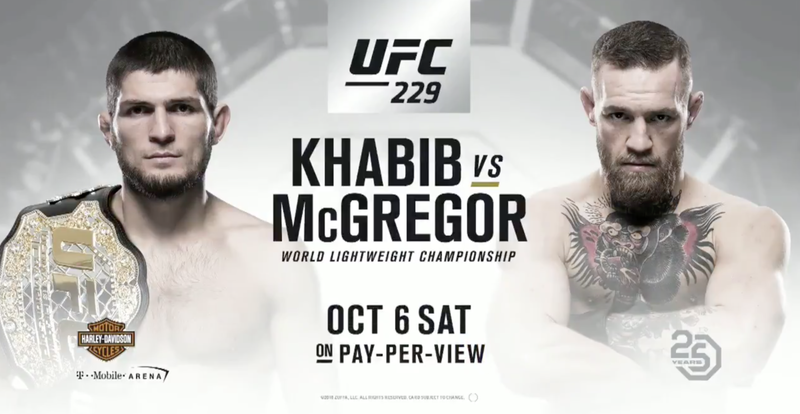 The fight will be the main event of UFC 229 on Saturday, October 6th in Las Vegas, NV. It was announced at Friday's UFC press conference but neither man was in attendance. Nurmagomedov won the interim version of the title in a dominant win over Al Iaquinta at April's UFC 223, a fight that originally was supposed to be against Tony Ferguson. When McGregor was eventually stripped of the title, the 'interim' was dropped. McGregor was last seen knocking out Eddie Alvarez to win the title at UFC's debut in Madison Square Garden in November 2016. He hasn't competed in MMA since then with the Mayweather fight as his only daliance into fighting.